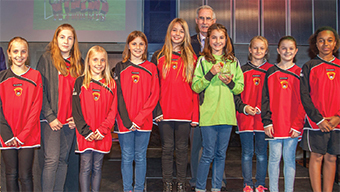 SPORTSMEN and women, budding stars of the future and the cream of local coaching staff were honoured at a prestigious awards ceremony held on Wednesday last week. 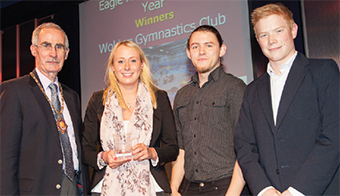 Hosted by Eagle Radio’s Lewis Mason and attended by Woking Mayor Tony Branagan, the Sport Woking Awards applauded the achievements and contributions made to sport in the borough, while recognising and rewarding talented local performers, coaches, volunteers, teams and clubs. Collecting the top prize on the night was Woking Football Club’s Jane Spong. She was presented with the Trotman Trophy for her pioneering work in the club’s Football in the Community programme, a scheme which helps give youngsters, as well as seniors residents and those with mental health issues, a way into the beautiful game. Speaking at the awards, Mayor Branagan said: “I would like to extend my congratulations to all the worthy winners who are here this evening, along with everyone who has been nominated for their contributions to sport in the area. 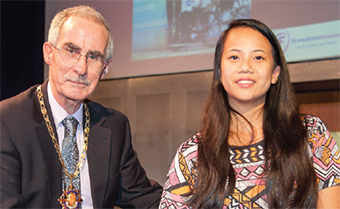 WINNERS have already been put forward for the Surrey Sports Awards in December.